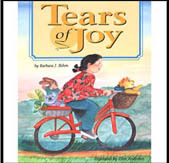 This month Becoming Gold is featuring Tears of Joy, the beautifully book written by Barbara J. Behm. A gentle guide to teach children and adult survivors the importance of sharing the secrets of not only childhood sexual abuse, but all the secrets that can change who they are. FEATURED ARTICLE FOR MAY ! >The Altruistic Web is Helping good news travel faster..please go to http://www.altruisticweb.com , you can also read a wonderful article written by the Editor, Belle Wong click here. Want to see others comments? Check out the Guest Book!